If using dried morel mushrooms, wash the caps and soak them in warm water to cover for 10 minutes. Remove the stems and discard them. Cut small morels in half and large ones into three or four pieces. In a medium saucepan over medium heat, heat the olive oil and sauté all of the mushrooms for about 3 minutes. Add the shallots and garlic and sauté for 2 minutes. Season with salt and pepper to taste. Add the wine and cook to reduce the liquid by half. Add the stock and bring to a boil. Add the cream and bring to a boil. Reduce heat, cover, and simmer the soup for about 25 minutes. In a blender or food processor, purée half of the soup until the consistency is very smooth. 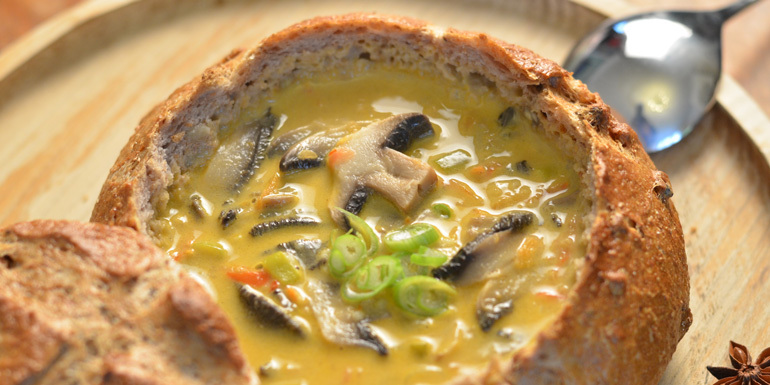 Pour into bread bowls and garnish with fresh rosemary, sliced mushrooms, and scallions. What other delicious dishes have you tasted onboard that you’d like to try at home?